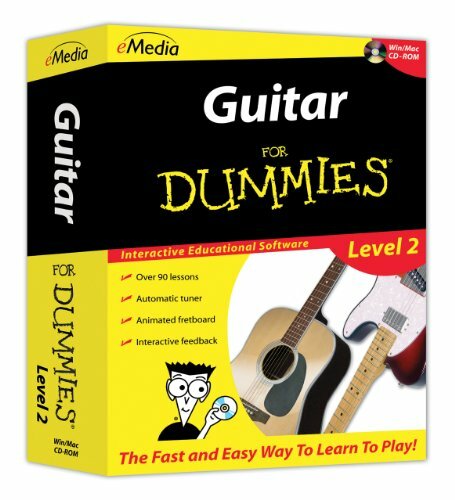 eMedia Guitar For Dummies Level 2 gives you everything you need to continue your journey toward being an accomplished guitarist! It is perfect for anyone who already knows some open chords and is ready for more. Over 90 step-by-step lessons will take you through reading music notation, playing melodies, finger picking and different styles of play including rock, blues, folk and country. New Instant Feedback listens to your playing and highlights notes played correctly in melodies so you can learn faster. Have fun playing along with live recorded songs or MIDI tracks you can slow down or speed up. Your teacher is professional guitarist Kevin Garry, Ph.D., from the University of Colorado at Boulder, who demonstrates techniques in full-motion videos. The excellent teaching he offers will help you become a good guitarist and offers exceptional value. eMedia Guitar For Dummies Level 2 elevates your playing with over 90 complete guitar lessons by Kevin Garry, Ph.D., University of Colorado-Boulder, award-winning guitarist and music professor. Lessons teach more chords and strumming styles, fingerpicking, reading guitar tablature and music notation, and other guitar techniques. Learn popular songs including hits made famous by Heart, The Animals, and others to keep practicing fun. These include "Scarborough Fair," "Dreamboat Annie," and others. eMedia's Animated Fretboard showing fingerings for chords and notes played in the lessons. Interactive Feedback recognizes notes you play correctly in melodies. The Note and Finger Tracker tools display the notes you're playing in music notation and on the Animated Fretboard. Select any section of songs or exercises to loop or change tempo for focused practice. Over 40 helpful videos, including split-screen views, make learning easier. Built-in guitar tools include eMedia's Automatic Guitar Tuner, Guitar Chord Dictionary, Metronome, and Recorder. Great for both acoustic and electric guitar.